My client purchased the empty lot adjacent to their home several years ago and put up the bamboo fencing around the perimeter. More recently, they added the French doors visible on the side of their house, in anticipation of the new garden. The lot was originally overgrown with Echium, Eucalyptus saplings, Blackberry vines, Poison Oak, various grasses and other invasive weeds. 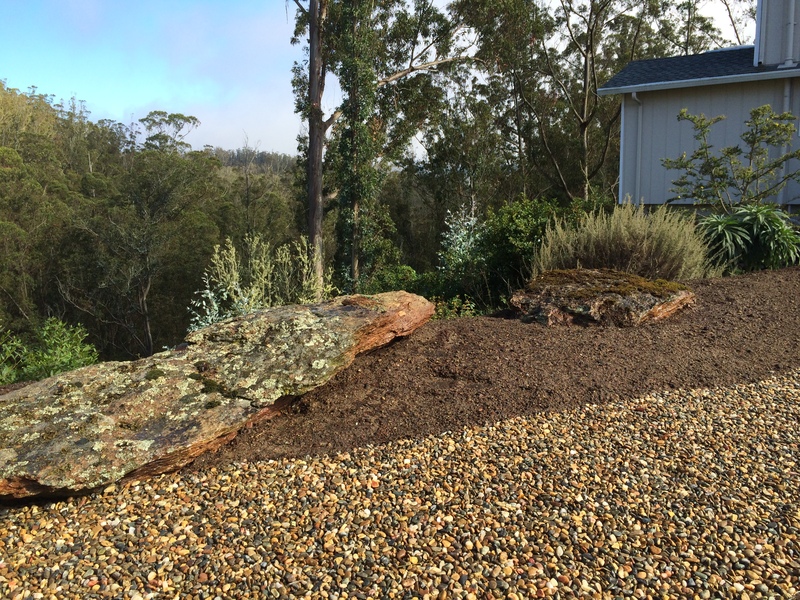 The first 35″ of the 50″x 100″ lot was level, the rest inclining steeply into a deep, Eucalyptus-filled ravine, leading to the decision to only landscape the level portion. Several years ago, the slope leading into the ravine had been cleared of a mature Eucalyptus grove to give a fire break to all the homes that backed onto it. Once they were gone, the native plants very quickly grew back- primarily Rhamnus californicus (Coffeeberry) with Poison Oak and Coyote Bush interspersed. 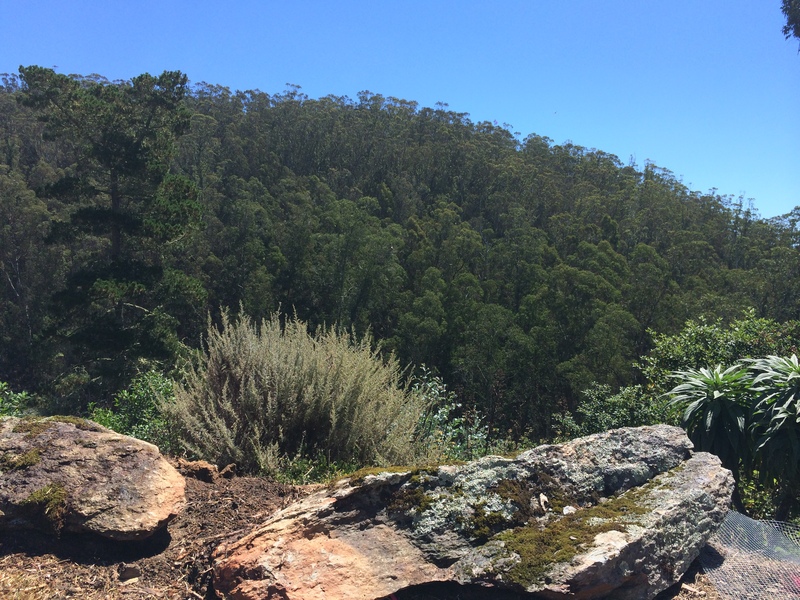 In the above picture, these lovely natives are visible, along with a couple stubborn Eucalyptus saplings that are, and will continue to be, a maintenance issue. 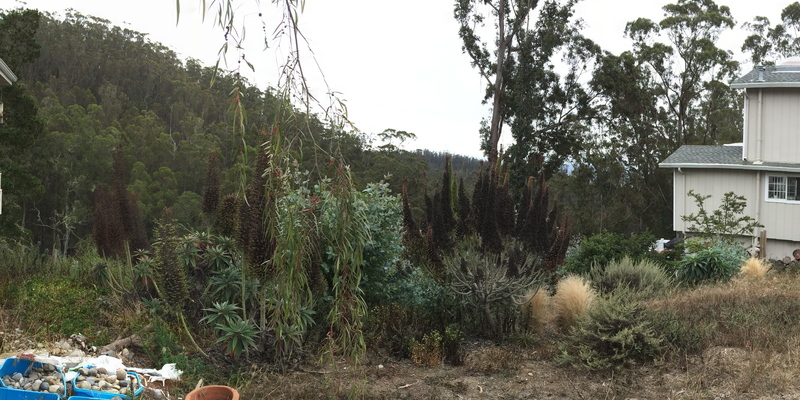 I also decided to leave a few Echium, as long as they were low enough to not block the view. Visible on the slope up the other side of the ravine is the complete coverage of Eucalyptus trees that had come up to the back of these lots and houses before the fire break clearing. 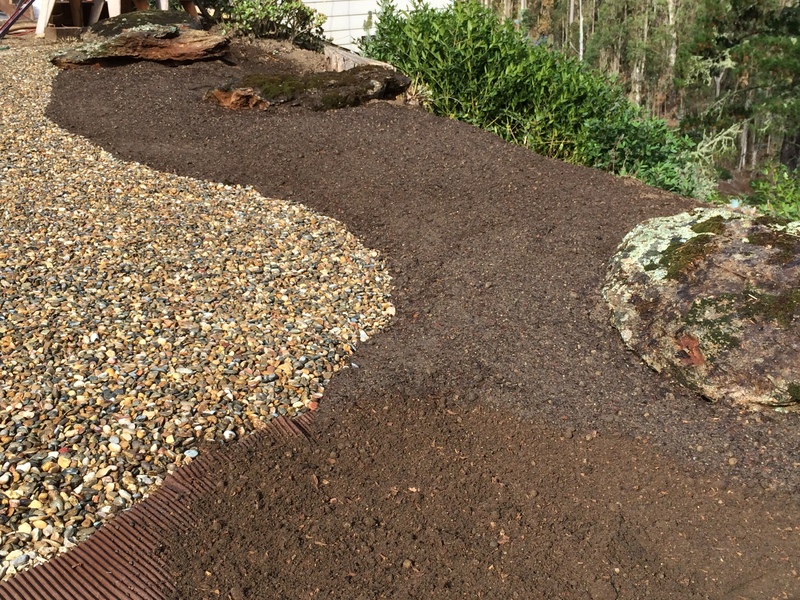 The path is layers of drain rock, gold fines and multi-colored pea gravel- all compacted really well over a lining of gopher wire. In fact, 95% of the project area is underlayed with high-grade gopher wire and then a double layer of corrugated cardboard sheet mulch. Using sheet mulch is a great way to be able to landscape over a weed-filled lot or a existing, healthy lawn, without having to dig them up. This potentially saves labor and landfill space, and also the decomposing plant material helps improve the soil. (at the bottom of this image, a bit of the cardboard is visible) The native soil on this site was almost solid decomposed granite(low organic matter, good drainage), so I brought in richer soil and built it up over the wire and cardboard, planting primarily smaller plants so we didn’t have to cut through anything. The plant palette will be mostly natives and adapted plants, with a small percentage of ornamental (“fluffy”) plants closer to the house. Within a year, after having received a good start with the richer soil, the cardboard will be decomposed, the roots will grow through the wire and they’ll do fine in the native soil, as most are native or low water use plants. Next post will be after planting. Stay tuned!